UPR 79-93 Pro Series 1" Short Chrome Moly Tubular A Arms are fully Tig welded and the safest and strongest units available in the industry with their .095 wall design. Lighter and stronger than any of our top competitors A-arms without even the Slightest Sacrifice in integrity or strength. These Arms are 1" short for drag applications that use aftermarket brakes that tend to push the tires out too far. The shorter arms bring the front tires & wheels back in where they belong. 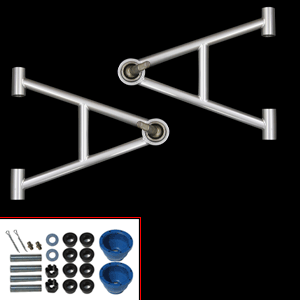 Our tubular A arms also come with high quality ball joints with zerk fittings for easy maintenance. All of our Suspension Products are made with the Highest Quality materials and most expensive components. We spare no expense on our products and always stand behind them with our Lifetime warranty that no one else offers. Comes with 2 sets of Energy Suspension bushings to choose from. Black bushings 95a durometer for street/strip or Red bushings 98a durometer for road and drag race applications.